It is estimated that 40 million pounds of lobster are caught off the coast of Maine each year. Maine is famous for its rocky coastline, second home dwellers, its lighthouses and now, its food. As we researched our trip to Maine months prior to heading north, we read of the perfect lobster roll, if in fact, there is a perfect lobster roll. We assumed that is and will forever be, the only food group in Maine. Come to find out, lobster is only part of the story. like pros. Our cousin, Helen, our hostess for the beginning of our trip, had three beauties steamed and on our plates within minutes of our arrival. Maybe it was the fact that I simply stared at the crustacean on my plate rather than diving in, or possibly the confused look on my face that told of my limited history with eating lobster. Fallon, her granddaughter, sat beside me and watched me fumble with my nut cracker and contemplate just how to remove the meat from a lobster's hind end; I knew she could do this in her sleep. Having been basically born at sea (as most Maine people are), it's second nature. After a little education, I looked like a Maine lobster-eater, juice, multiple napkins and all. Fresh lobster, fresh butter - things were going good. 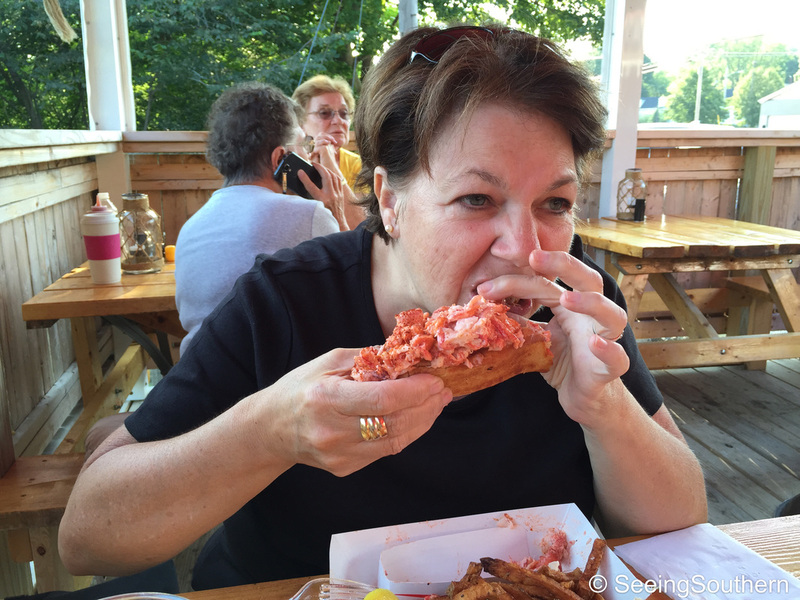 The next day, it was time for the lobster roll - Claws in Rockland, Maine. As Meghan, the local beside me who ordered who her own lobster roll proclaimed, "the best food in Maine is found on the side of the road." I ordered Rockland's Finest Kind Lobster Roll ($17); Len, the Fried Crab Roll ($14). In the Lobster Capital of the World (Rockland) we indulged in the the fresh catch of the day, smothered in butter, cradled between fresh buns. According to their website, there's nothing "but a touch of Hellmann's and a perfectly toasted New England style hot dog bun." We ordered the boat which added fries and coleslaw. It was a heaping portion that sent me right over the edge; I was grabbing napkins once more and enjoying my first roll! For desert, it was Nana's whoopie pie that sucked us in. A good 5" in circumference, oozing with cream, sold to the TwoCoots who couldn't resist a sweet recipe handed down from grandma. It lasted two days, but opened up an entirely new eating experience. 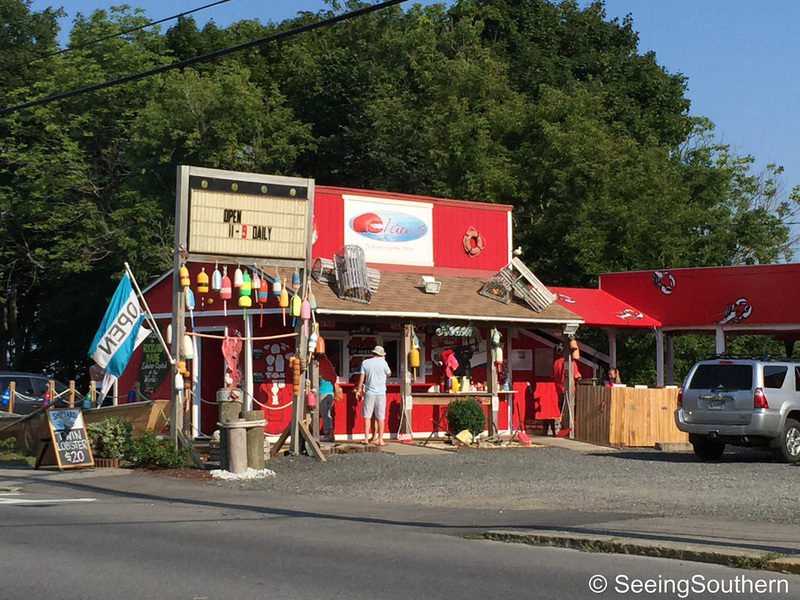 If you're traveling through Rockland, glance toward the bay as you round a sharp turn and let the red shack catch your attention; they're open 24/7 and they have a whoopie pie and roll with your name on it. 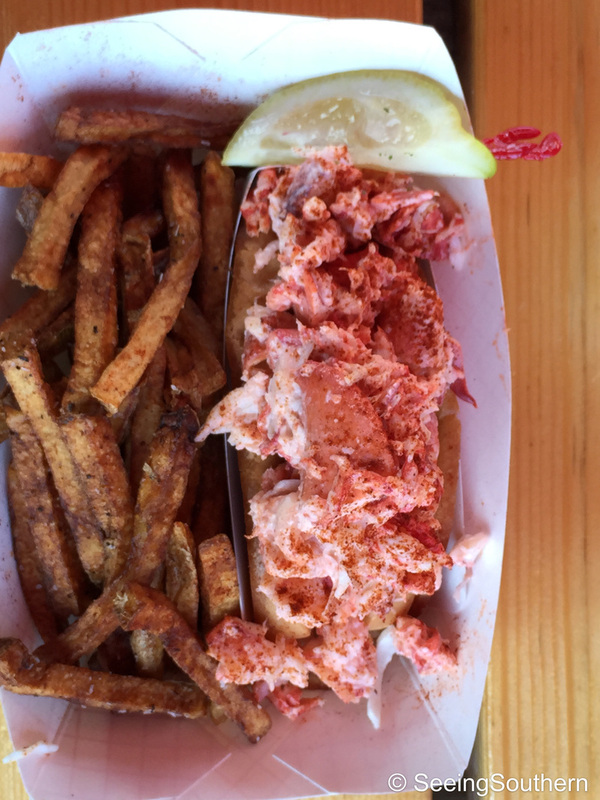 *Lobster Roll aficionados tell me that THE place for this succulent treat is in Wiscasset, at Red' Eats. I must say that with my limited love for lobster and as pricey as these sandwiches were, I was content with one, and it was good, so I didn't push my luck. So, I chose to pass through "Maine's prettiest village" and simply gander at the line at Reds which always stretches around the corner toward the Route 1 bridge. Exactly like Claws, it's a very unassuming, beside-the-road shack that stuffs its small bun with nearly a pound of lobster love. Perfect food to-go as you sit in the usual traffic jam through Wiscasset. 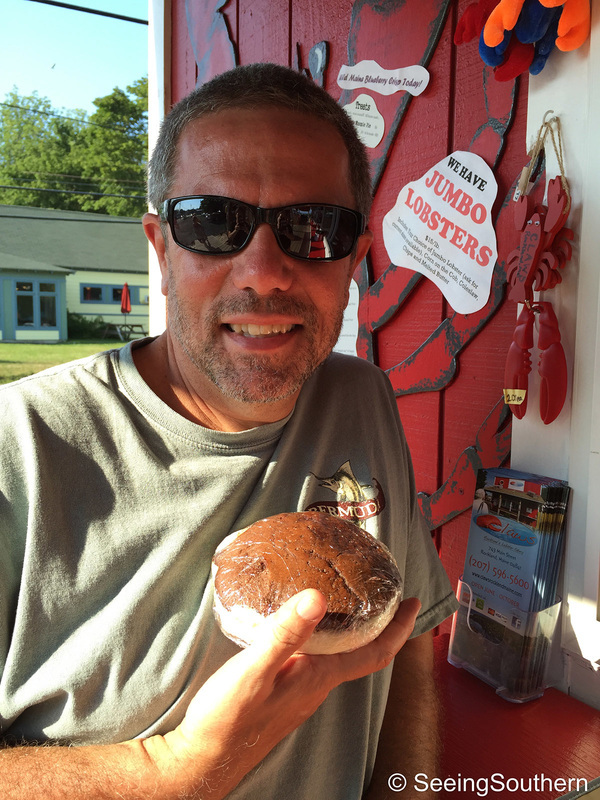 That leads us into the next food group: the whoopie pie, Maine's official state treat (Maine's official dessert, the blueberry pie). It's history is born from a Pennsylvania Amish tradition and quickly became a cake-lovers dream. I guess we've always know they existed, but who knew you could find them at every restaurant, every fishing village general store, every airport restaurant in Maine- and they weren't just wrapped in cellophane, mass-produced by the thousands. They were homemade, cream gushing from two bookends of devil's food cake. And there's even varieties - in my refrigerator right now (a souvenir from Linda Bean's at the airport that will disappear with delight), a peanut butter, a chocolate chip, and of course, an original. Can you say heaven? We had no clue what popovers were until we heard our breakfast mates at Clark Point Inn asking for directions to the Jordan Pond House specifically for the popovers. Located in Acadia National Park, the Jordan Pond House has been a destination for travelers for years. It was in the 1890s that Nellie McIntire began serving popovers and tea out on the lawn so that guests could have a awe-inspiring view of the Bubbles (twin peaks east of Cadillac Mountain, Mt. Desert Island's highest point). You can trace the home's history back to 1847, when the original house was built by the Jordan family. The House was founded as a restaurant by Melvan Tibbetts in the early 1870s, providing a centerpiece of birch bark dining rooms and fieldstone fireplaces. It was purchased by John D. Rockefeller and it was given to the National Park Service. The original home was destroyed by fire in 1979. Back to the popovers . . . . afternoon tea has remained a tradition at Jordan Park House and many consider it a must-do when visiting Acadia National Park. There's also a full menu for lunch and dinner, but we opted for tradition - afternoon tea with popovers and lemonade - ask to be seated on the lawn. 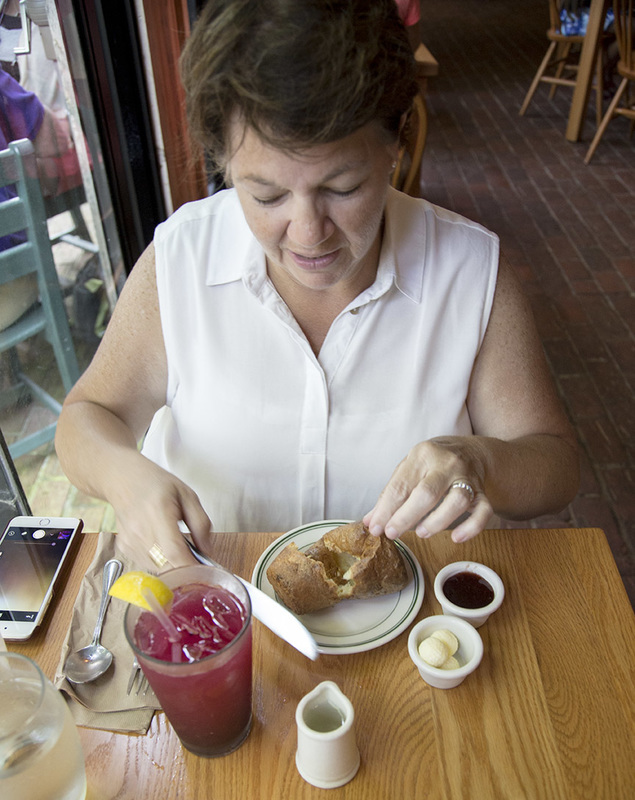 A popover (basically a light, hollow roll made with an egg batter, baked and served with strawberry jam and butter) and blueberry lemonade. If you go - no matter what time of day you go - make a reservation. Otherwise, wait-time will be at least an hour. Oh, and please, take a free shuttle. Who knew Blueberries could be so good? The blueberries you and I eat at home more than likely come from Maine. 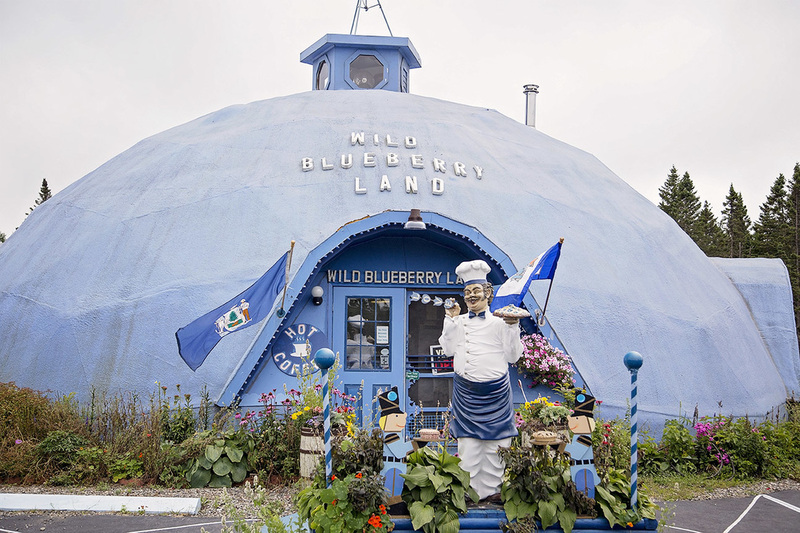 As the largest producer of wild blueberries in the world and producing ten percent (including wild and cultivated; Cooperative Extension Office, 2015) of the nation's supply, Maine's 44,000 acres of naturally producing fields and barrens run from Downeast to the state's southwest corner. They require very little management because as indigenous to the area, blueberries are naturally resistant to native pests and require minimal managements. Grown on a two year cycle, the harvest happens each August. Bar Harbor capitalizes on blueberries with their wild blueberry soda, Old Soaker. Surprisingly amazing!